Be Tire Smart Canada stood track-side with Raptors in-game and digital host, Kat Stefankiewicz, as she got the low-down on essential gear for the winter driving season. From your choice of tires to what you put under the hood and in the trunk, a bit of planning can go a long way toward avoiding the pain, expense and danger of a winter road mishap. 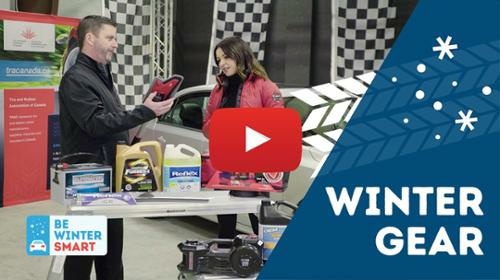 Canadian Tire product specialist, Chris Heck, explains how to get your ride winter-ready. 1. Battery – Be sure to have your battery inspected regularly to maintain reliable engine starts. Look for a battery designed to provide reliable starting in cold temperatures. 2. Winter-ready wiper blades – Not all wiper blades are created equal when it comes to handling extreme cold temperatures and preventing snow and ice build-up, so ask in-store about winter wiper blade options that fit your vehicle. 3. Winter windshield washer fluid – Make sure your windshield washer fluid is effective up to -40 degrees Celsius and regularly top up your reservoir so you’re always ready for flying snow and ice. 4. Synthetic oil – Synthetic oils are designed to flow better at low temperatures, making for better cold weather engine starts. 5. Keeping your car clear of snow and ice – Use a telescopic snow brush and ice scraper to clear all vehicle surfaces (including headlights and taillights) before you shift into drive to ensure maximum visibility for yourself and prevent flying snow and ice from distracting other drivers. 6. Winter safety kit – While avoiding mishaps is always goal number one, be ready for the unexpected with an emergency kit that contains winter safety essentials like jumper cables, roadside reflectors, a tow rope, candles, matches, flashlight, shovel, traction mat, phone charger and basic gear to keep you warm. 7. Commute plan – Check your local weather forecast and plan your route so you’re not caught off guard by inclement weather; services like Ontario.ca/511 (@511Ontarion on Twitter) can help you plan routes in advance. 8. Adjust your habits – Adjust your driving to the changing weather conditions. Take your time, drive defensively, and keep extra distance between you and others during the winter. Chris from Canadian Tire gets Kat up to speed on essential winter driving gear. It’s easy to forget that four postcard-size patches of rubber are all that stand between your car and the road. Especially during winter weather, your choice of tires can mean the difference between a safe ride home and a costly collision. 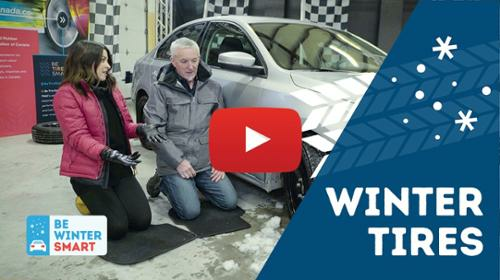 Professional driving instructor, Kevin Cronin, explains why winter tires are the perfect travel companion for your winter commute. Ask your local tire service professional about options that meet your needs and check out this list of winter tire brands and models available in Canada.